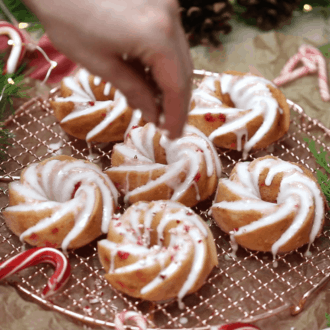 My mini bundt cakes are filled with gooey pockets of peppermint and covered in a minty glaze. You know I love a bit of crushed candy cane for a festive sprinkle this time of year. When you add peppermint to a baked good it should give a refreshing kiss of mint not overpower the other flavors. 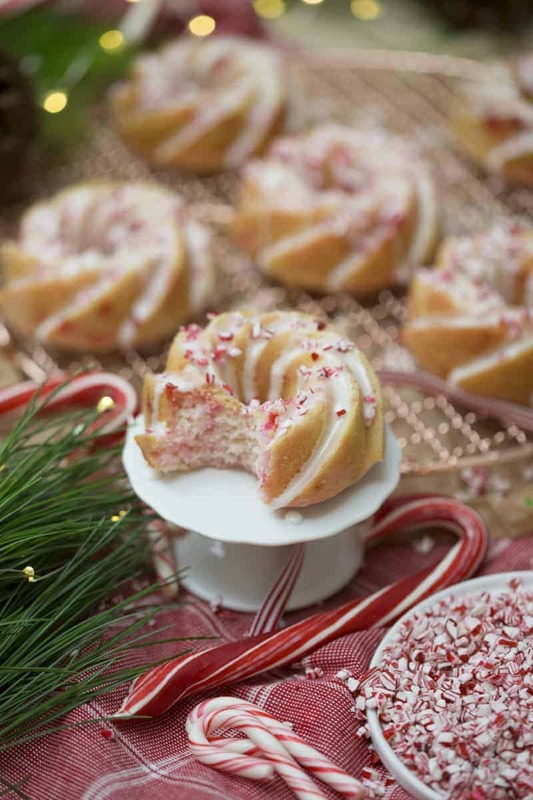 I would never be tempted to eat a candy cane but baking with them is a totally different story! 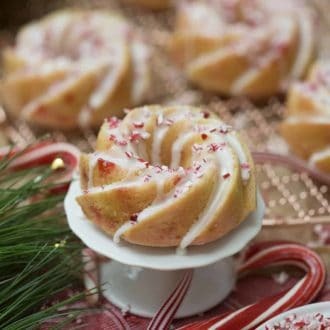 I added 1/3 cup of crushed candy cane to this recipe but you should feel free to sprinkle in some more in. It liquifies in the oven and forms these ultra-moist pockets in the batter; so good! Watch the bake time carefully. Any time you use a smaller mold the baking time is decreased and the risk of having an over-baked, dry cake is doubled 😱 No one likes dry cake! If you HATE peppermint then go ahead and substitute toffee chips or nuts for the candy cane and skip the peppermint extract or swap it out for vanilla or almond extract. 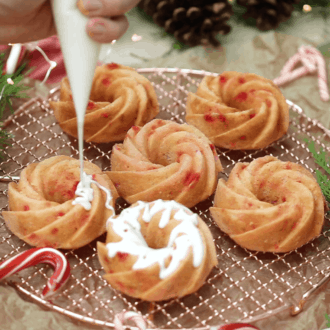 If you’ve tried these bundt cakes then don’t forget to rate the recipe and let me know how you got on in the comments below, I love hearing from you! 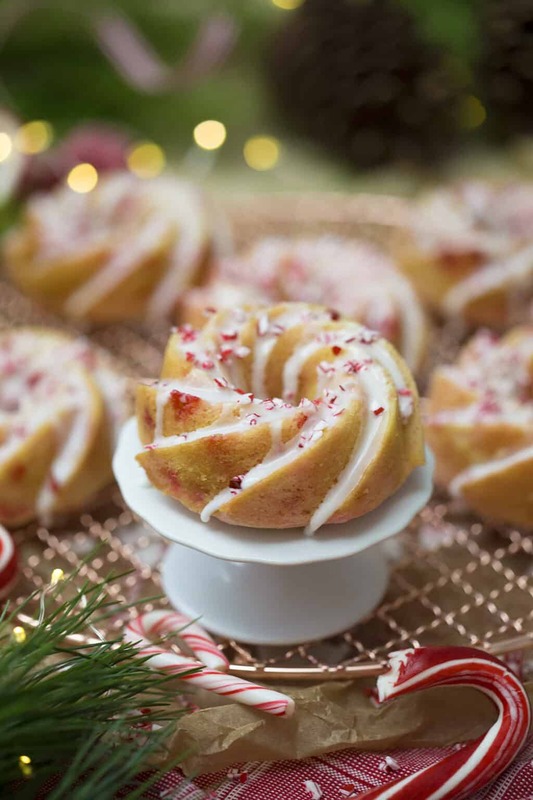 Mini vanilla bundt cakes filled with gooey pockets of peppermint and covered in a minty glaze. Preheat to 360 degrees F. Grease and flour a mini bundt pan. Sift flour, salt and baking powder in a bowl, whisk and set aside. In a stand mixer fitted with a paddle attachment, cream the butter, then mix in sugar. Add in vanilla and sour cream. Mix until creamy. Mix in egg whites slowly, then mix on medium until combined. Alternate adding milk and flour mixture, beating until batter is just combined. 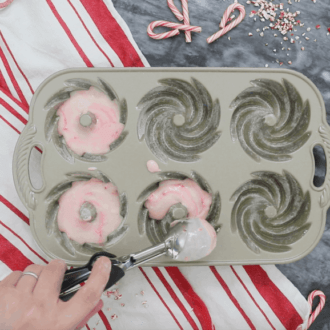 Fold in crushed candy cane. Do not overmix. Sift confectioners sugar into a bowl. Add milk and peppermint and mix. Transfer glaze to a piping bag. Previous Post: « Ode to Garlic! These were perfect for christmas eve! So yummy! First time ~ I forgot to add the salt because it was left out of the instruction steps. Came out a little “flat” tasting, but good enough to try a second time (with the salt). Baking right now, hopeful of results! Thanks John! This looks so good (and more important, easy). One silly question: do you mean “add baking powder’ in the instructions? 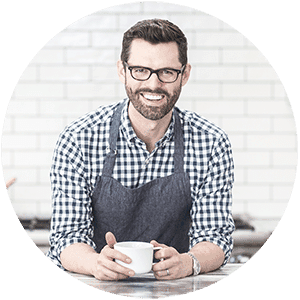 For there is no baking soda in the ingredients. By the way, I’m not good at baking so I generally follow the recipes strictly (except for the amount of sugar). I did and I just fixed that! Thanks for bringing to my attention! !